The Magazine, by AirShowsReview.com, is now available for downloading. The Magazine features articles and photos about air shows, pilots, military veterans and more. Your free downloadable copy is waiting for you in a .pdf format. Please use Acrobat 7 or later, which is required. 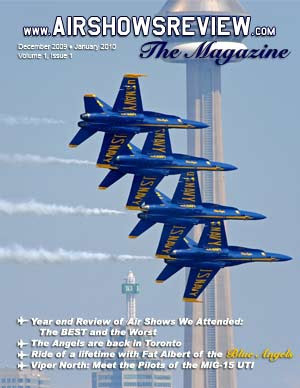 The Premier December issue features: The Best Air Show in 2009 award, from our staff of professionals who attended North American Air Shows in 2009, The Blue Angels, Viper North's Mig-17 UTI and lots of photos from air shows. Enjoy our first of many issues. 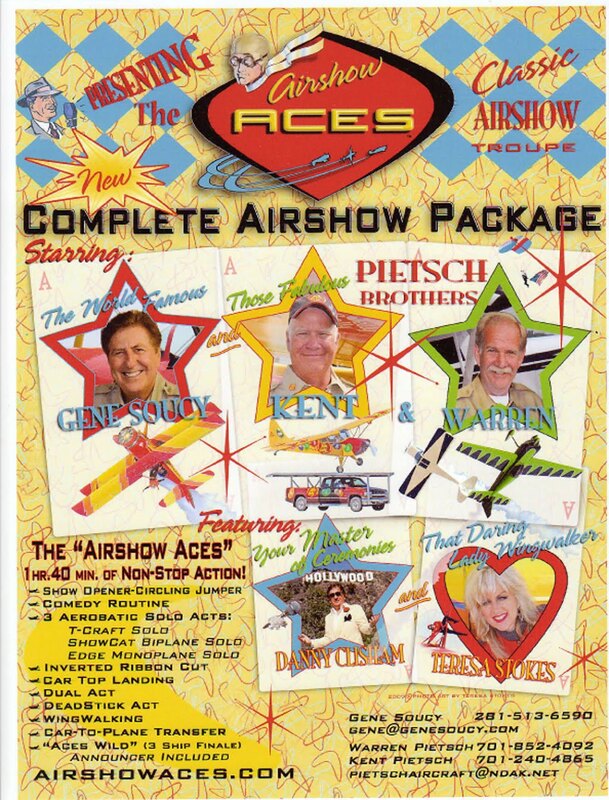 Gene Soucy Airshows has joined forces with and Kent and Warren at Pietsch Airshows to form an exciting new airshow component, the Airshow Aces. Fashioned after the classic airshow troups of the 50’s and 60’s, the Airshow Aces provide a stand alone 12 act, 1 hour. & 40 minute, complete airshow package utilizing 6 perfromers, 4 aircraft and a special “truck top airport” vehicle. The fully coreographed show which also features announcer Danny “Hollywood” Clisham, and Wingwalker Teresa Stokes, is now booking for the 2010 airshow season. 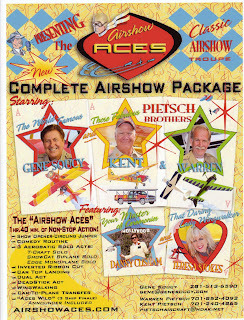 The "AIRSHOW ACES" - a 12 Act Airshow Package - 1hr. 40min. of Non-Stop Action! Don't know if you've heard or not but the P-38 called Glacier Girl that they recovered from the glacier on Greenland and restored was taken to England to go into their Air War Museum and during a demonstration flight, the pilot was doing some slow rolls parallel to the runway and simply sank into the ground where it crashed through a line of parked airplanes in a ball of fire. Not Accurate! GG is well in San Antonio. So have no fear, Glacier Girl is fine and all in one piece. The Boeing VC-137C SAM 26000, also known as Air Force One when a president is on board, will be taken off display on Dec. 5 to be painted back to its original presidential paint scheme. Painting is expected to take several months, and the aircraft is currently slated to return to the Presidential Gallery on Feb. 13, 2010, in time for Presidents Day. The Presidential Gallery will not be open for touring on Dec. 5 due to aircraft movement, but the regular schedule will resume on Dec. 6. Visitors are asked to plan their trip accordingly. Click here for more information. The museum wants to make sure veterans who served in the "Forgotten War" are remembered and honored throughout 2010, and it has partnered with other organizations in the Dayton area to commemorate the 60th anniversary of the Korean War with special events and the opening of the museum's renovated Korean War exhibit area. Korean War veteran groups as well as individual veterans and their families can find additional information and register now for the Dinner Under the Wings and Exhibit Opening, Freedom's Call Military Tattoo and Korean War Memorial Ceremony. Commemorate the 106th anniversary of the world's first heavier-than-air flight by learning about the Wright brothers and their incredible invention during Family Day from 10 a.m.-3 p.m. on Dec. 12. Activities include comparing heavier-than-air flight to lighter-than-air flight by observing model (paper) hot air balloons as they're launched as well as hands-on demonstration stations and storytime. Visitors can also make paper flight-related ornaments from 1-3 p.m. in the Modern Flight Gallery. Click here for more information. Looking for a unique gift for someone on your list? An Air Force Museum Foundation membership or something from the museum's gift shop could be just what you need. Shop online at www.airforcemuseum.com or purchase gift cards for use in the gift shop, IMAX Theater or Morphis MovieRide. The National Museum of the U.S. Air Force will be closed on Friday, Dec. 25, and Friday, Jan. 1. The gift shop will be closed for inventory on Thursday, Dec. 31 (museum still open from 9 a.m. until 5 p.m.). The IMAX Theater will be closed Jan. 4-6 (museum still open from 9 a.m. until 5 p.m.). On Dec. 7, 1941, the Japanese attacked U.S. military and naval facilities on Oahu in the Hawaiian Islands without warning, dealing the United States a staggering blow. On Dec. 8, the U.S. declared war on Japan. Germany and Italy in turn declared war on the United States on Dec. 11. The U.S. then declared war on those two Axis partners of Japan. The museum's Pearl Harbor exhibit features a diorama of Lt. Phillip Rasmussen and his P-36, a flag flown on the USS St. Louis during the attack and an A-2 flying jacket worn by Col. (Ret.) Lew Sanders when he reportedly became the first person in U.S. uniform to shoot down an enemy aircraft in World War II. Click here for more information about this exhibit. - Find out where we will be over the summer. This link will be live as soon as participation at airshows is finalised. Aviation News :: An Interview with Sully from FlightAware > Discussions | The host of 'Forum', Michael Krasny, will be interviewing Chesley "Sully" Sullenberger on his show Monday morning during his second hour of his program, at 10am PDT (6pm GMT) on 11/30/09. Those of you with iTunes should be able to catch it live, and MP3 downloads and podcasts will be available shortly afterwards. Just a heads up if anyone would like to catch it. This is a call-in program as well, so you can call up to ask questions/make comments. http://www.kqed.org/radio/programs/forum/ EDIT: Those without iTunes can visit here to find various ways to listen in. from AVWeb Podcast - Podcast | The FAA released air traffic control recordings of the exchanges concerning Northwest Flight 188 on Oct. 21 as it overflew its destination by 150 miles. AVweb's Russ Niles snipped the highlights of those tapes and prepared this report. Concorde's Heathrow Home At Risk from AVwebFlash Current Issue | Officials at London's Heathrow airport say they just can't find a good spot to display their Concorde and may have to get rid of it, a prospect that has Concorde fans up in arms. "The Queen of the Skies should now be the Queen of Heathrow," said Ben Lord, spokesman for the Save Concorde Group. Instead, the airplane has been shuffled around from place to place, and is now stored behind a maintenance hangar. Earlier this year, the airport tried to sell off the airplane to a buyer in Dubai, but the deal fell through. Plans to display the Concorde in British Airways' new terminal also did not materialize. "Heathrow is the world's most congested airport and finding a permanent location is not proving straightforward," an airline spokesperson told the London Times. "We are looking at a number of options for the aircraft including a permanent home at Heathrow but have not made any decisions." Lord said his group would vehemently oppose moving the airplane. "Heathrow played a vital role in the 27 years of Concorde's commercial lifetime, and it's critical that Alpha Bravo remains there," he said. One-of-a-Kind Metalplane Up For Auction from AVwebFlash Current Issue | A 1929 Hamilton Metalplane, the only one of its kind that has been restored to flying condition, will go on the auction block soon in Scottsdale, Ariz. The airplane is hangared in South St. Paul, Minn., and will remain there until a new owner takes possession. The airplane was No. 22 of only 29 built, and was originally owned by the Canadian Forestry Service. After a long useful life in Canada, Alaska, and Washington State, it was fully restored in Minnesota in the 1970s. It was flown to airshows and won several awards, including Grand Champion trophy at the Antique Airplane Association National Convention in 1975 and the Silver Age Champion award at Oshkosh in 1976. Interested bidders can preview the Hamilton on Dec. 12-13 from 10 a.m. to 3 p.m. at Fleming Field Airport in South St. Paul. The aircraft will be sold in an auction conducted by Barrett-Jackson in Scottsdale in January.No reserve price has been set..
from Warbirds Online by Tom Kwiatkowski Sr. | Hi Folks, well, I'm back. Did ya miss me? Did you notice I was gone? Seems I had some personal stuff coupled with some computer issues and before I knew it, the month is now over and we're deep into the "Holiday" (aka Christmas) season. Ho Ho Hopefully things won't be so messed up for the rest of the year. Since I've been gone for so long, why don't we try once again to get down to some serious history, shall we? Yes, I think we shall. Tom K.
After 60 years out of the cockpit, 93-year-old Joe Szep stepped into the pilot's seat of a glider at Minden-Tahoe Airport on Tuesday. With copilot Mike Moore of Soar Minden sitting behind him, Szep was towed by a plane up into the Valley's wide, shimmering-blue sky. "I've never been in a glider," he said before take-off. "I'm sure it will be a different experience all together." In the 1920s and 1930s, the "Golden Age of Aviation," women were involved as parachutists and competed in the first All-Transcontinental Women's Air Race, known as the Powder Puff Derby, Chabrian said. The participants of that race, who hadn't had an opportunity to meet other women aviators, eventually formed The Ninety-Nines, the International Organization of Women Pilots. The 1,070 members of the Women Airforce Service Pilots (WASP) ferried aircraft during World War II. By the 1960s, Chabrian said, women were more prevalent in the ranks of flight instructors and charter operations, but it wasn't until the 1970s that the first woman airline pilot was hired. "In the 1970s, the airline management wasn't sure what the public reaction would be toward ..
4Filmmaker Adam White is releasing "Flight of the Red Tail," a companion piece that follows three years after release of "Red Tail Reborn." The 12-minute film chronicles the events of the Red Tail Project, including the fatal crash of pilot and project leader Don Hinz in 2004, the five-year restoration journey to flightworthy status, and the captivating stories surrounding its return to the sky in 2009. On Friday, October 23, 2009, The San Diego Air & Space Museum unvieled the Lockheed Vega 5B used in the Movie "Amelia," which opened in theaters on October 23, 2009. Hilary Swank played Amelia Earhart. The plane was created as a prop for the film and was donated to The San Diego Air & Space Museum by Avalon Pictures. Amelia Earhart flew a Lockheed Vega 5B on her historic solo flight across the Atlantic Ocean. This movie features vignettes from her early years when Earhart was captivated by the sight of an aircraft flying overhead on the Kansas prairie where she grew up, her life over the preceding decade gradually unfolds. Also talks about her husband and her historic first women to cross the Atlantic Ocean. Also about when she failed and needed repair on the Lockheed L-10 Electra. Uncontrolled Airspace #161 "Endless Quest to Fill Space"
Weather permitting on Monday, November 30, a World War II, F6F-3 Hellcat fighter plane will be raised from the depths of Lake Michigan off the Chicago shoreline. The plane has rested on the lake bottom for more than sixty years after crashing during a training exercise. How the first U.S. air race launched an aviation tradition. 15-day tour includes: Two major airshows — Duxford and Shuttleworth; 11 aviation museums & collections; privileged-access visits; Free time in the historic cities of London, Lincoln, Stratford-upon-Avon, Warwick, Cambridge and Windsor. June 28–July 12, 2010. Meet the Editor and members of the Aeroplane team. This week Airbus announced that the first flight of the Airbus A400M has been scheduled to the week December 7 - 13, if weather permits. After almost three decades, NASA's space shuttle program is nearing the finish line. Gen. David Petraeus returned to the aircraft carrier Nimitz after taking a ride in an F/A-18F Super Hornet jet fighter yesterday. So near, and yet so far . . .
Will 'Black Box' Be The New TV Experience?